Come to the warehouse and bring your empty, rinsed wine bottle. These are empty wine and beer bottles in the warehouse! Not that we drink while working (we wish! ); we brought them from home because we need to transfer the contents of a big 25 liter tin of olive oil which arrived badly damaged. This one was so badly damaged that our friendly shipper, IS, couldnt take it. Therefore we needed approximately 50 bottles. We’re almost there, but not quite. 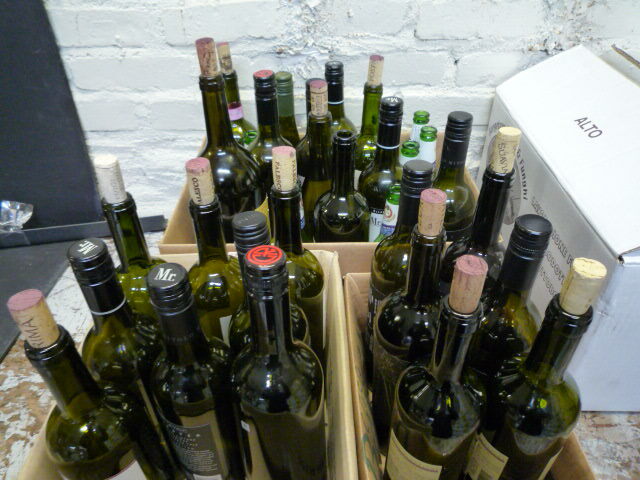 If and when you come to the warehouse to pick up your order, do bring your bottle (it must be rinsed and with a cork). We’ll give you a sample of Tratturello EV Olive Oil of Obama fame, made with local Gentile di Larino olive, in Molise by Francesco Travaglini. Previous Post Have a coffee with Gustiamo and you’ll fall in love, too. Next Post These figs are explosive and the FDA is investigating. Bene, now, we must only think some recipes to try Tratturello…we can check on Gustiamo web site or…where ever you want. Hello Stefano, I don’t know whether you read this. I would like to ask about the use of RINDS from Parmiggiano Reggiano. I don’t know what to do with them, so I usually “donate” them to the mice in the field. (We live far away from humans in a field between 2 mountains, so we are the strangers among wildlife here, and any food donations are usually welcome by our non-human “neighbours”). I would be interested to learn what I can do with those rinds. Cook in the soup and then take it out? Like a Laurel leaf, for example? Will the aroma of the rind go into the soup, or how is that working? I would be grateful for any advice, also from other cooks who might be reading this.